Fantome (Homepage) wrote: Great natural geometry ! tom (Homepage) wrote: Fantastic light and structures. pippone (Homepage) wrote: wow, thats a fantastic structure and colour pic, I like that dark frame around the yellow motive! Xavier Rey (Homepage) wrote: nice work ! TP@Photoskiasi.com (Homepage) wrote: Excellent texture and details. Tom (Homepage) wrote: Very cool macro shot. Tim Corbeel (Homepage) wrote: Wonderful shot! Great light and I like the detailed structure as well! grant (Homepage) wrote: wow - excellent macro...very well done. reminds me of a lizard's skin. Marie (Homepage) wrote: superbe détail graphique. martie (Homepage) wrote: Gorgeous macro! A.B.C. Photography (Homepage) wrote: Beautiful texture, color and especially the lighting. Ilger.nl (Homepage) wrote: Again...great details. The light adds something extra to this one. Nice. Marcie (Homepage) wrote: Fantastic detail and light. Love how the leaf fills the frame with yellow!!! Michael Rawluk (Homepage) wrote: Amazing detail, light, and colour. That is exquisite. Laurie (Homepage) wrote: This is gorgeous. The light is wonderful and really brings out the amazing details. Angelique (Homepage) wrote: Beautiful details of fall. Zing (Homepage) wrote: Awesome macro, great details and colours. 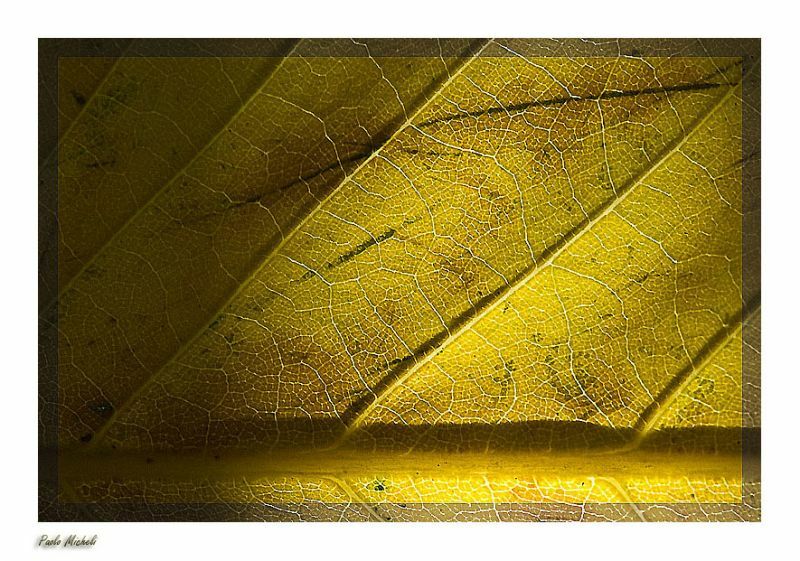 Andrew (Homepage) wrote: Great color, texture, and huge detail in this colorful leaf! Awesome natural road map! Suzanne Cummings (Homepage) wrote: Beautiful image. The leaf seems almost like leather. 613photo (Homepage) wrote: This is original take on the subject. Executed well. Good shot. Peety (Homepage) wrote: Beautiful macro shot. The tons and colors are perfect. beanow (Homepage) wrote: Very interesting colour and frame. AC (Homepage) wrote: Very well thought of and executed snap. Really like the lighting and the way the veins have come out so sharply. Ylloh (Homepage) wrote: great macro-shot! Evgeny Pogorelov (Homepage) wrote: This is beautiful paolo, i really like the border effect, it frames the macro very well. Vink (Homepage) wrote: Very nice texture and details ! Well done ! Liang (Homepage) wrote: Very nice abstract photo!